That data is taken from Social Bakers for Q1 2013, it shows that Facebook users have declined in a whole load of markets. 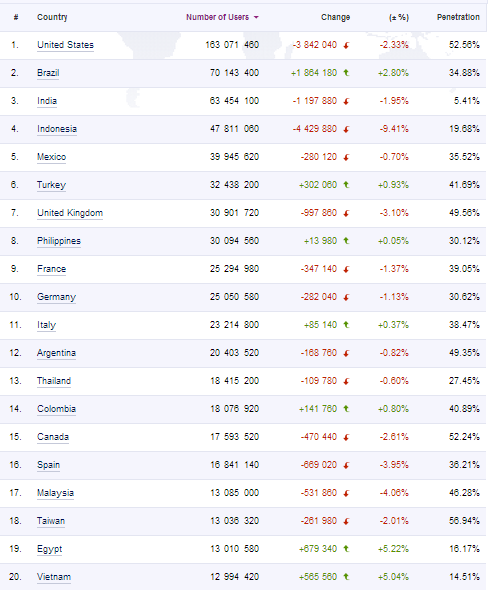 Europe and the USA are most numerous in the list of markets but the biggest % declines are in Indonesia and Malaysia. This is a concern for Facebook, when combined with other recent surveys about Facebook losing their younger user base this could become a real problem. Now the real question is does this mean that Facebook only continues to show paper growth as older users and lagards get into it and due to a few developing markets (Brazil etc.) but it’s not as important as it was 12-24 months ago as sites like Tumblr, Twitter etc. grow? When Mark Zukerberg first started thinking big about Facebook he wasn’t thinking about the company as “cool” or about how to maximise revenue (he actively opposed advertising on the site) he was thinking about how to create a utility, something that became part of the collective routine of the internet generation. Not an easy thing to do, but now Facebook sits alongside Google as a true internet utility, it is THE social network. And that’s the thing, the ubiquity of the site, particularly in the sub 30 demographics, have led to investment among its users, by that I mean investments of time… People have invested a lot of time learning Facebook, adding friends, uploading photos, building networks and it has entered our lexicon, “Facebook me” or “I facebooked them” is universally recognised. So when you think about “the next facebook” or “a facebook killer” you are thinking in the wrong way, the development cycle in social networking has gone beyond that now, just as the search engine wars ended and are now dominated by Google the social networking wars are now ending with Facebook and twitter dominating the mainstream. That does not mean there is not room for innovation and new ideas, sites like Pinterest show that all too clearly, but these sites need to think about how they work with the big boys, not how they usurp them. Let me put it really simply: Who wants to spend a load of time setting up and maintaining ANOTHER site like Facebook. The next big innovation will integrate it, not replace it!